Rodents (order Rodentia) are by far the most diverse group of mammals on earth, accounting for over one third (~2200 species) of the world's estimated 6500 species of mammals. The number of rodents known to science is constantly changing, both because new species are regularly discovered and because taxonomic revisions can either combine separate species into one, or split a single species into two or more new species. 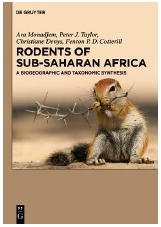 In this book, the authors have set out to provide an accessible, accurate and updated reference work that covers the identification, distribution and taxonomic relationships of the 463 known rodent species in sub-Saharan Africa. They have chosen sub-Saharan Africa, rather than providing a continent-wide coverage, to keep the material down to manageable proportions, and also because the rodents of North Africa are more affiliated to those in Europe than to the rest of Africa. Among the authors are those with extensive experience as curators in African natural history museums who are well connected with museums across both anglophone and francophone Africa. Although there have been other recent reviews (for example Happold's1 account of African rodents published in 2013), there is a need to update such accounts as new information comes to light. This book should be seen as complementary to works like Happold's publication. It does not include the wealth of information on the ecology, behaviour and reproductive biology covered by Happold and others, but rather focuses on taxonomic and biogeographic insights that build on an 'extraordinary renaissance' in species discovery, as well as on the fact that molecular techniques are becoming less costly and easier to use. These modern techniques often confirm the delineations put forward in early classical studies that were subsequently 'obscured by lumpers and pheneticists of the middle twentieth century'. To illustrate this, the authors point to their accounts of 31 species of Otomyinae (vlei rats and whistling rats), compared with only 17 species covered by Happold's recent account, as an example. Besides being of biogeographic and taxonomic interest, rodents are also of importance to conservation. While none of the 463 species recognised is known to have become extinct, there are 44 species listed in the IUCN Red List as Critically Endangered (3), Endangered (21), Vulnerable (15) and Near-threatened (5). However, this picture is not complete, as there was insufficient information to determine the conservation status of 52 species, and a further 100 species have not been evaluated in terms of their conservation status. In addition, rodents are important as transmitters of diseases and as pests of crops. For example, more than 60 zoonotic diseases (i.e. those transmitted from animals to humans) have been attributed to rodents. The authors therefore identify their target audience as, inter alia, mammalian biologists, conservationists, public health workers, epidemiologists and agriculturalists. The bulk of the book (988 out of 1092 pages) is dedicated to species accounts, based on examination of tens of thousands of museum specimens, literature records and online museum database records. There is detailed information at a genus level, including defining characters, cranial and dental features, and habitat and biogeography. The species accounts that follow have a focus on distribution and habitats, rather than on biology and ecology, which is covered in other publications. At the genus level, there are images of skulls and dentition (molars), while at the species level there are distribution maps and, in some cases, colour photographs. The distribution maps show point locations for specimens rather than a distribution range, and although the photographs include some of live specimens, many are of mounted museum specimens only. Common names are not included at a species level, although collective common names are provided for each genus (for example 'whistling rats', 'sun squirrels', 'mole-rats' or 'spiny mice'). Taxonomic treatises such as this one will always go out of date as new species are discovered, and as taxonomic revisions find new ways of classifying species. That said, this is an exhaustive examination of a significant mammal group, and it is likely to remain a valuable source of information for decades. It would, as the authors suggest, be most useful if it is treated as a companion volume to other publications, as it will assist in identifying particular species that are of conservation, biogeographic, medical or agricultural importance. The book should be a valuable addition to the library of any serious scientist working in any of these fields.